If a person does a Google search on the Internet with the words “Waterfall Capital of the World”, it will come up with “Hamilton – the Waterfall Capital of the World”. Why is this? Well, the Niagara Escarpment (which is a UNESCO World Biosphere Reserve) runs through the entire length of Hamilton and every creek, stream, drainage swale, and storm sewer system (which have replaced several creeks) that flow in Hamilton towards Lake Ontario over the Niagara Escarpment, can result in one or more waterfalls. Over 100 waterfalls and cascades have been found (131 at last count as of February 2010), documented and photographed in Hamilton. It is believed that Hamilton has the most number of waterfalls and cascades of any urban center of its size (500,000 people) in the world and thus is referred to as “The Waterfall Capital of the World”. While driving over the Skyway Bridge (at the southern end of Lake Ontario) from Toronto in the north (one hour away) towards Hamilton, most people only see industry – the steel factories and all their smoke stacks. However if you look beyond, into the distance, you will see a tree line escarpment which runs through the entire length of Hamilton. In this tree lined escarpment wall are the waterfalls! There are no rivers in Hamilton, thus the size of the waterfalls are nowhere near the magnitude of Niagara Falls, located one hour away towards the south east, however these smaller waterfalls and cascades offer something different; serenity, solitude and a personal interaction with the falls which is not possible at Niagara Falls. The Bruce Trail (with its several side trails) along with the Chedoke Radial Trail at the Chedoke Civic Golf Course follow the escarpment and do provide access to numerous waterfalls. It should be noted however, that many waterfalls have seasonal dry periods due to their small catchment areas but at least 30 have year round flow making a visit at anytime of the year worthwhile. Hamilton’s waterfalls are not just for viewing one time or in good weather. The views change drastically in all four seasons for the majority of these waterfalls and cascades. For example; at Tiffany Falls, ice climbing is permitted during the winter as ice completely covers this waterfall. Or if water flows are slightly reduced in drier periods, you can actually walk behind a few of them and stay dry such as at Buttermilk Falls. The highest waterfall in Hamilton is Tew’s Falls at 41 m or 135 ft. and the shortest that is considered a waterfall for Hamilton’s list is 3 m or 10 ft. which is Little Davis Falls. One of the most popular waterfall sites is Webster’s Falls (the widest at 100 ft. or 30 m.), as it is situated in a large park area. Another twist to exploring Hamilton’s waterfalls is being done by Chris Ecklund and his group of waterfallers where they have been lighting up different waterfalls each night with colored spotlights. This takes a bit of work to set up the battery powered colored spotlights safely in the dark around the waterfall. You may notice the waterfall poster depicted with this article. Currently there are three of them, Waterfalls of Hamilton Seasons, Waterfalls of Hamilton Autumn and Waterfalls of Hamilton Spring. 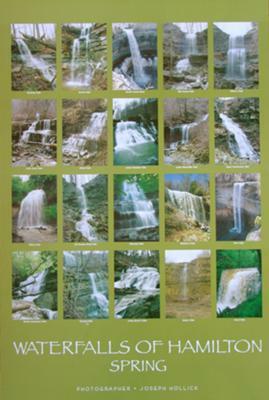 Each poster shows 20 of Hamilton’s waterfalls, the first one in the four seasons, the next in Autumn and the third in Springtime. This Spring poster won the 2008 Ontario Tourism Award for Best Travel Photography in Ontario!